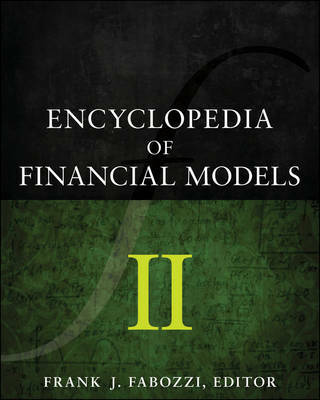 Volume 2 of the Encyclopedia of Financial Models The need for serious coverage of financial modeling has never been greater, especially with the size, diversity, and efficiency of modern capital markets. With this in mind, the Encyclopedia of Financial Models has been created to help a broad spectrum of individuals ranging from finance professionals to academics and students understand financial modeling and make use of the various models currently available. Incorporating timely research and in-depth analysis, Volume 2 of the Encyclopedia of Financial Models covers both established and cutting-edge models and discusses their real-world applications. Edited by Frank Fabozzi, this volume includes contributions from global financial experts as well as academics with extensive consulting experience in this field. Organized alphabetically by category, this reliable resource consists of forty-four informative entries and provides readers with a balanced understanding of today's dynamic world of financial modeling. *Volume 2 explores Equity Models and Valuation, Factor Models for Portfolio Construction, Financial Econometrics, Financial Modeling Principles, Financial Statements Analysis, Finite Mathematics for Financial Modeling, and Model Risk and Selection * Emphasizes both technical and implementation issues, providing researchers, educators, students, and practitioners with the necessary background to deal with issues related to financial modeling * The 3-Volume Set contains coverage of the fundamentals and advances in financial modeling and provides the mathematical and statistical techniques needed to develop and test financial models Financial models have become increasingly commonplace, as well as complex. They are essential in a wide range of financial endeavors, and the Encyclopedia of Financial Models will help put them in perspective.